Inspired Style Guide: RED HOT! It’s RED HOT! Let’s do an Inspired Style Guide based on this gorgeous photo. When it comes to wearing red, the one thing to keep in mind is that it’s a statement color. Keeping your accents to pops of red, instead of all things red is really the key to pulling this bold color off- no matter your skintone/hair color. As you can see, these beauties are each wearing a different tone of red, which best matches their gorgeous skin tones. One woman has chosen to pull the red accent with the flowers in her headband, while the second woman plays off the hue of her blouse. 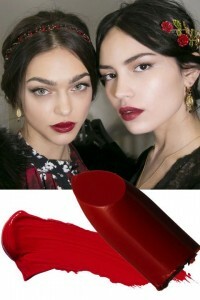 Both are a completely beautiful way of accentuating their red lip, without taking it over the top.